I get about 3-4 requests to connect in LinkedIn each week. Maybe one of them is from someone I know. It seems like a lot of people attribute the number of contacts you have to value while the reality is that it’s the value of your relationships which matters. And, while you might be limited to a theoretical maximum of real friends, I think you can have an expanded professional network which is larger but doesn’t include anyone and everyone who can spell your name. That being said, I’ve worked in several industries and several parts of the country (and tend to enjoy networking) so I have a big network in LinkedIn (>1,000). But, I constantly review it to see if things are getting old or if the person that I worked with on a deal has simply faded away. In the last year, I’ve dropped over 300 people that I had previously connected with. So, like I’ve done with the blog and Twitter and Facebook, I figured I would post on how and why I use LinkedIn. But, there are lots of professionals out there who will tell you how to optimize its use. For corporate purposes, I think Hubspot puts out a lot of great information and data. The key for me is believing that if I reach out to someone in my network they will know who I am and be willing to respond or help the person I’m routing to them. Whether you’re a political junkie or not, if you’re in the healthcare industry, the political landscape has become increasingly important over the past decade. And, with the government being the primary payer, they have the ability to drive trickle down changes through everyone’s care. So, even if you don’t work in the industry, but you’re a patient, you should care. What happens in DC will change healthcare which will affect you either today or in the future. At the same time, I think most people in Washington DC are living in Disneyland. Government salaries continue to go up. Employment continues to go up. They have pension plans. They have robust health insurance offerings. Real estate has stayed strong. They don’t really understand what the rest of country is experiencing. A financially stable country in which we have a legitimate chance to be economically successful. An infrastructure which provides education for our kids and the overall workforce. A safe neighborhood and country in which to live and where our rights as outlined in the Declaration of Independence are protected. Leaders who use our tax money as if it was their own money when making decisions. A country where hard work is rewarded and there’s a safety net to protect us when we get sick. Healthcare costs are one of the big drivers of bankruptcy. 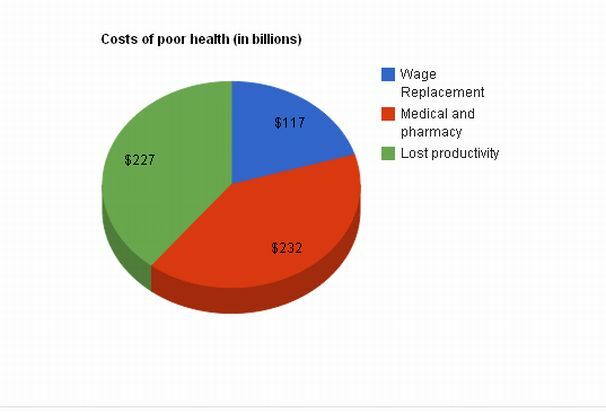 Healthcare policy (or lack of it) drives a huge amount of waste. Lack of sleep, commuting times, cost constraints, stress, exercise, and diet are all correlated with health which is a huge burden on our global competiveness. BUT, I do think there is macro-economic element here some of which is done differently in other countries (if you believe there is something to learn from them). What if we required employees to use all their vacation time each year? Would this decrease stress which is a driver of several healthcare issues? Would this decrease unemployment? What if we limited the work week to 45 or 50 hours? Would that decrease unemployment? Would that increase people’s involvement in their families? Would this increase time spent exercising? Would it increase hours slept? What if we created incentives to help people move for work? Would this decrease commute times and improve health and the amount of dinners people eat with their families (and not from fast food)? What if we limited school hours and the amount of homework and mandated recess? Would this increase exercise, decrease childhood obesity, and impact overall health? Of course, all my practical business friends would tell me that this would kill our global competitiveness. And, my skeptical friends would point out that this would create more time, but we wouldn’t use that time to improve our health. Others of you would point out that companies would just look for more productive workers not hire more people. But, I would argue that if we plan to differentiate ourselves on innovation and creativity then health is very important. Health already represents more of the cost of a car then the steel and more of the cost of coffee than the beans. The WHO has now said that obesity is the number one healthcare issue to tackle globally. It impact presenteeism. It impact absenteeism. And, your creativity is limited when you don’t sleep due to stress or other healthcare issues which is often magnified in the sandwich generation. We always hear about how little time the average primary care physician (PCP) spends with a patient although some research shows it’s actually going up. At the same time, there is a debate about whether healthcare reform will push us into a massive physician shortage which seems to exist in some areas already. I keep hearing about more and more things that the PCP should be doing during this encounter. They should be counseling on medication adherence. They should be addressing gaps-in-care. They should be handling prior authorizations real-time using a computer system. They should provide the patient with Ix (information therapy) steering them to apps and articles for them to understand their treatment. They should be coordinating with the patient’s care manager. They should be screening everyone for obesity. They should be screening everyone for alcohol abuse. It was the last two that were recent recommendations for the US Preventative Services Task Force that prompted me to comment here. I’ve heard everything from about 8 minutes to 15 minutes per patient encounter and complaints about the amount of time spent on documentation and administration continuing to go up. So, how does a physician add in all these different tasks into this already short time window when patient already leave confused and not remembering most of what the physician told them. Of course, concierge medicine and other physician practices are trying to change this in certain pockets. And, ideally Accountable Care Organizations (ACOs) or Patient Centered Medical Homes (PCMHs) where the focus is less on volume and more on outcomes have a chance to change this. I guess the question in my mind is whether the physician is this gatekeeper or whether chronically ill patients need a care manager / patient navigator to help them understand their benefits, take advantage of the resources available to them, leverage their care team, and understand their disease and clinical options. I am a big believer that we need to change our approach to how individuals manage their health. After a dinner with a financial planner friend of mine, it got me thinking what if we helped individuals plan for a long healthy life the same way we help them plan their careers or their finances. We have whole industries dedicated to helping people make smarter investment decisions for their retirement and job choices for their careers, but when it comes to our health we are rarely proactive. 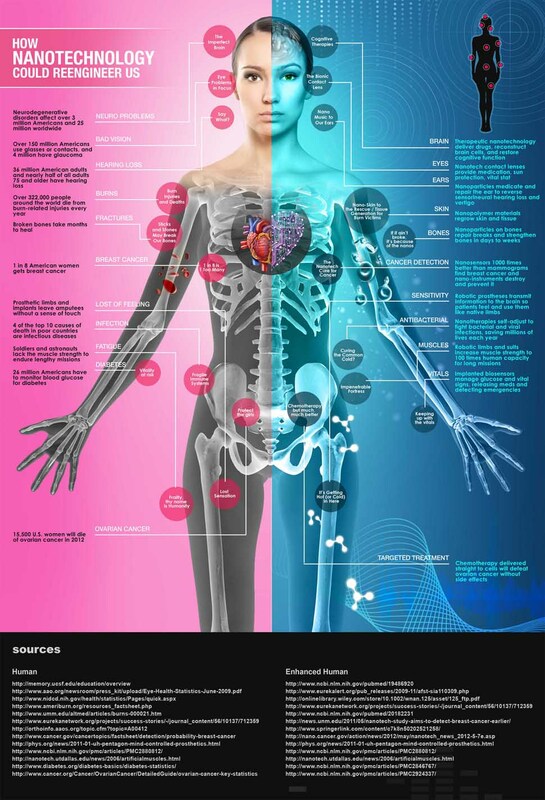 The common thread through all of these reasons is personal health. Whether concerned directly about illness, both our own and that of our loved ones, or about our ability to enjoy our retirement to its fullest, personal health is a key component of a well-planned retirement. Step 1: Conduct a Personal Health Audit. Before you can build a plan you need to understand your base-line. You can’t map directions to your destination until you know where you are. When you meet with a financial planner the first thing they want to know is how much money you have saved for retirement. Your personal health plan is the same way. Do you suffer from any chronic illness? What is your height & weight? How much exercise to you get? What are your eating habits? Do you have any family history of disease? What type of pain do you suffer from? How is your mental health your relationship with your spouse and children? Capture everything and identify areas that need attention or improvement. Step 2: Define Success. What does a healthy future look like? The second question a financial planner will ask you is how much monthly income will you need in retirement to live the lifestyle you want? The same is true for health. When do you plan on retiring? What hobbies do you have that you would like to pursue? Do you plan on having grandchildren? How will bad or good health impact all of these plans? Does your family history require you to focus on preventing cancer or heart disease or Alzheimer’s? The ability to visualize your health in the future both good health and your health if you let yourself go is a strong motivator for change. A point of note: Thinking about health 30 or 40 years into the future can be very abstract; I suggest breaking down your definition of success into annual targets is more manageable and motivating. Step 3: Know your Personal Health Indicators of PHIs. By this point in the process you should have a sense of what measurements are most critical to your health. Develop a method for capturing your PHIs on a regularly basis. For some like weight you might update your PHI daily, weekly or monthly. For others like a PSA level for men at risk for prostate cancer, you might update it annually. I detail some of the more common PHIs here: http://www.billpaquin.com/do-you-know-your-phis/. Step 4: Engage your Health Partners. Now that you have completed your audit, defined success and developed your most important PHIs it’s time for you to engage all of the people in your life who help you manage your health. This will include your family, your physician or other healthcare professionals; maybe you have a nutritionist, acupuncturist or other complimentary practitioner that you frequent. Inform them of your personal health plan and get their feedback and buy in. The more people who are on your side the greater the likelihood of success and the more people that know your health, the greater the likelihood you will have a plan that fits you and your goals. Step 5: Build and implement your Plan. Building the right plan takes an understanding of what you learned in steps 1-4. By way of example, if you have a family history of colon cancer, you need to understand what behaviors help reduce your chances of getting this cancer, what preventative screening you should be getting and when you should be getting them. All of our plans should include a path to maintaining an ideal Body Mass Index that includes some form of daily exercise and nutrition plan, but we are all unique and will have plans specific to our health situations and desired goals. I do think it’s important to understand that no one is perfect 100% of the time, if you deviate from your plan for a day, week or even month, you are only one day from starting again. Step 6: Review & Measure your progress. You can’t manage what you can’t measure. At some pre-planned interval you should step back and take stock of your progress. Use your annual physical or dental cleaning as a reminder to sit down and review your health plan. Personally I like to review different elements weekly or monthly, but find what works for you and stick with it. Like the stock market, it won’t be a straight line, but as long as the trend continues up over time you will be alright. No one is responsible for your health but you. We all need to take a proactive approach to our health. Developing a personal health plan is a great way to insure you live a long, healthy and happy life. Bill Paquin is the Chief Executive Officer at Vertical Health, a publisher focused on improving patient care associated with back pain and endocrine disorders such as diabetes. He is a husband, father and writer who is passionate about and supports the creative destruction of our current healthcare system. I keep seeing so many articles that I don’t always have time to research them and write them up. With that in mind, I thought I would share some quick summaries and links here. I always hear people talk about ROI around population health programs. The problem is that most people struggle to estimate the absenteeism and presenteeism costs associated with poor health. Various studies continue to reinforce that these costs actually exceed the medical and pharmacy cost savings. Here’s an infographic from my previous company – Silverlink Communications. How should I think about and structure the landscape? Who are some example companies in each area? Which ones are the best to use (and for what segment of the population)? I’m going to skip the 3rd question for now since there are business cases for any of these tools. The question is more about understanding your population and what your objectives are. And, ultimately, I told them what I tell many people…To see who the new companies are in these spaces look at the list of sponsors to Health 2.0, the presenters, and who’s recently gotten VC funding. This is going to capture some of the ones that are off the radar. 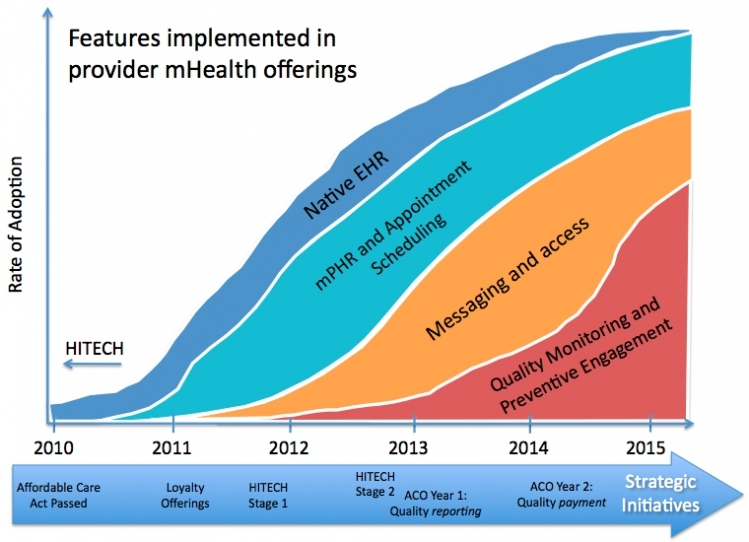 As far as I know, the EMR and practice management systems aren’t doing much here – Epic, Cerner, Allscripts. Although Athena did buy a small player in this space years ago. There are some companies trying to do this as part of their jump into the ACO space (e.g., Lumeris with NaviNet). I thought I’d wrap up with this image from Chillmark Research. I was looking up some information on using Twitter in healthcare prompted by the announcement around MappyHealth winning the HHS innovation award and found this that I thought I would share. 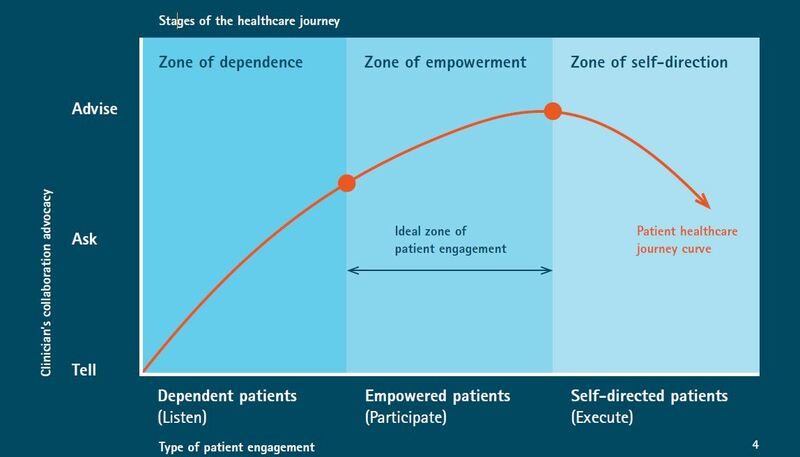 Who Cares About Patient Engagement In Health? I got a call today from a consultant who was researching the topic of patient engagement in healthcare. I found their questions interesting and really got me thinking about the topic. I’m going to turn my thoughts into a few blog posts this week. 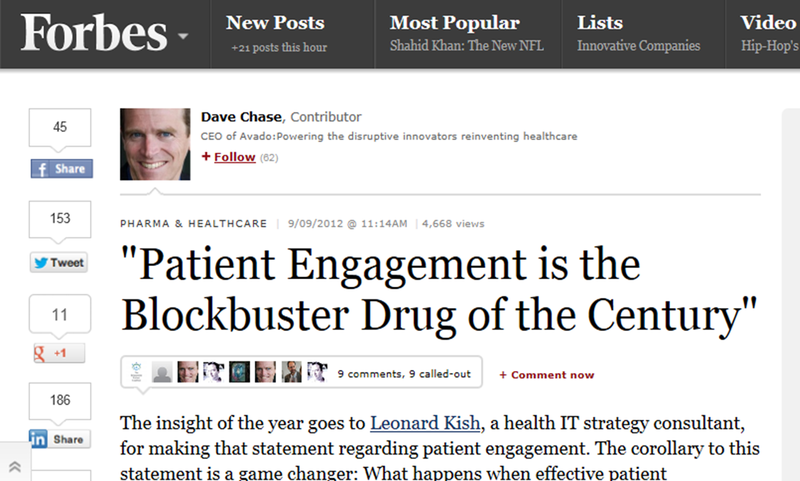 How successful are you at engaging patients? How successful are you at changing their behavior? What insights about the population can you provide me? With that set-up, here’s my someone skeptical view of who cares by constituent. Employers want to see results which requires patient engagement; how can I do this cost effectively? For example, imagine that the application can predict where you will be 24 hours later to within 65 feet. How much time are you in a car? How much time are you walking? How far do you walk? And, in the not too distant future, it will become a digital wallet and begin to track purchase patterns. Skeptical? In response to a request from Representative Ed Markey, major cell phone carriers revealed that they had received more than 1.3M requests for cell-phone tracking data from federal, state, and local law enforcement officials in 2011. (Time article – The Phone Knows All) They are using your phone data to solve crimes. If you’re not a criminal, this is probably good. It takes an average of 2 days for the Marshalls Service to find a fugitive these days versus 42 days in the past. The article talks about apps that collect your photos, your texts, and your contacts. But, from a healthcare perspective, especially as we move into an individual market, this data would be invaluable to an underwriter. Just like underwriters for car insurance want to track miles driven, average speed, and other data points, healthcare underwriters would love to understand your behavior. They know that sleep is correlated to obesity and other problems and most people sleep with their phone next to their bed. They know the importance of exercise and could map your location to a gym. They could also see how many steps you take daily. They know that having a social network is important to behavior change so they could understand your friends and their health status. They know that eating meals with your family is important. They know that eating breakfast is important. They know that being happily married is correlated with health. Heck. We already see increased accidents attributed to people walking and interacting with their smart phone. Maybe someday that will be a requirement to get a lower rate on healthcare. Maybe the younger generation won’t care. People continue to tell me that people in their 20’s just assume that everything is public and don’t see this “Big Brother” type of use of data as invasive. 1/3rd of Americans use their mobile device while driving a car, playing with their children, attending a party, and eating at a restaurant. There’s a good article in Time (9/17/12) called “Goal Power” by Dr. Oz. I found it interesting on a few fronts. 1. The topic of goals and objectives and their importance relative to healthcare behavior change is a repeating theme. I had a pharmacy client who was looking into this as part of an adherence program a few years ago. 2. The topic of behavior change and behavioral economics has been a very popular theme with Nudge and many other publications and programs over the past few years. 3. Obesity, which is part of the focus of his article, is widely becoming recognized as the greatest public healthcare challenge of the 21st century. And, it is a very complex issue tied to sleep, stress, social network, and many other factors. 4. He introduces the transtheoretical model (also known as the Prochastka model or the Stages of Change), which is widely known in the academic and health areas, into the public domain which surprised me. The transtheoretical model posits that health behavior change involves progress through six stages of change: precontemplation, contemplation, preparation, action, maintenance, and termination. Ten processes of change have been identified for producing progress along with decisional balance, self-efficacy, and temptations. Basic research has generated a rule of thumb for at-risk populations: 40% in precontemplation, 40% in contemplation, and 20% in preparation. Across 12 health behaviors, consistent patterns have been found between the pros and cons of changing and the stages of change. Applied research has demonstrated dramatic improvements in recruitment, retention, and progress using stage-matched interventions and proactive recruitment procedures. The most promising outcomes to data have been found with computer-based individualized and interactive interventions. The most promising enhancement to the computer-based programs are personalized counselors. One of the most striking results to date for stage-matched programs is the similarity between participants reactively recruited who reached us for help and those proactively recruited who we reached out to help. If results with stage-matched interventions continue to be replicated, health promotion programs will be able to produce unprecedented impacts on entire at-risk populations. 5. He references two of the big studies that looked at social pressure an its influence on health. Something that peer-to-peer healthcare and social network tools can create for us by developing support communities and “buddies” to support our change. 2012 study in the journal Obesity about weight loss. 6. He references Dr. Nicholas Chrisakis who co-authored the book Connected which is being manifest in the company called Activate Networks. Overall, for those of us that work in the healthcare field, these are all critical topics that we constantly talk about. It’s nice to see it brought to the “popular press”. Here’s an infographic on healthcare costs from http://www.complianceandsafety.com. I think this info graphic goes well with the other one on exercise and academic performance. I’m a big believer in the value of recess to build social skills, take a break from the classroom, and provide kids with exercise.